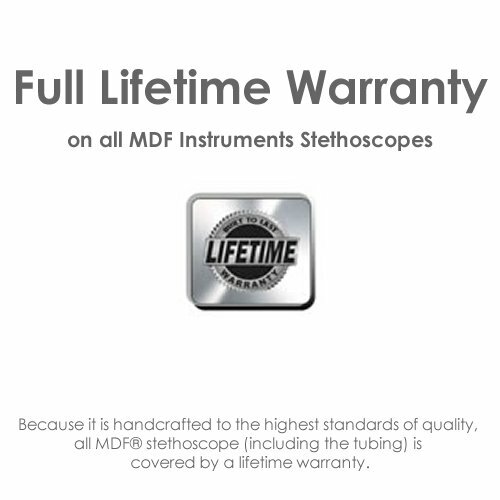 Handcrafted Since 1971 | Lifetime Warranty | Free-Parts-for-Life Program | Latex FreeConstructed from acoustically-superior stainless steel, the MDF® MD One® Stethoscope delivers accurate auscultation of heart, lung, and Korotkoff sounds with acoustic integrity and clarity. An ergonomic design ensures comfort for the doctor and patient, even during extended use. 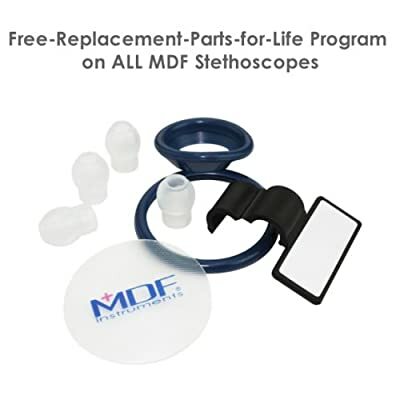 The MD One® is a premier diagnostic instrument with unmatched performance, durability, and aesthetics.Chestpiece: The handcrafted stainless steel dual-head chestpiece is precisely machined and hand polished for the highest performance and durability. The full-rotation acoustic valve stem with green indicator dot allows the user to easily identify the active sound channel and seals in sound.Acoustic Tubing: Constructed of thicker, denser, latex-free PVC, the Y-configuration non-stick acoustic tubing provides insulation for superior sound transmission and seals out ambient noise while preventing the cracking and wearing that can occur from repeated use. 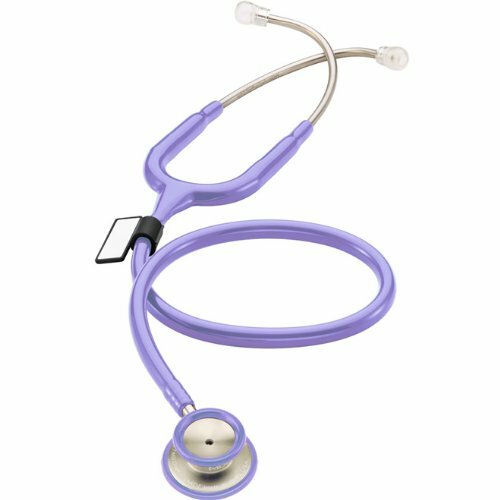 The longer-than-average length allows a comfortable space between health professional and patient.Acoustic Pyramid Chamber®: A patented internal metal-alloy chamber located in the acoustic tubing below the spring keeps the tubing channel open for maximum sound transmission into the headset.ErgonoMax® Headset:Hand polished, pre-angled stainless steel headset features a patented internal dual-leaf spring construction for durability and custom fit. Soft silicone ComfortSeal® eartips (available in standard and small sizes) are clear for hygienic purposes and conform to the ear to seal out extraneous noise while ensuring comfort during extended use. Patented SafetyLock® eartip adaptors lead the industry in user safety.Included Accessories: 2 extra sets ComfortSeal® eartips, spare ultrasensitive diaphragm, and ID tag. Handcrafted Since 1971 Lifetime Warranty Free-Parts-for-Life Program Latex Free Included Accessories: 2 extra sets ComfortSealTM eartips, spare ultrasensitive diaphragm, and ID tag.